Motorcycle racing has gained a great deal of popularity among the companies bringing in new racing style motorcycles, the government bodies promoting the sport, and above all, riders/racers who have a passion for the sport. One of the many dedicated and skilled riders in Nepal is Bibesh Shrestha who recently won the National Category of Racemandu 2017. 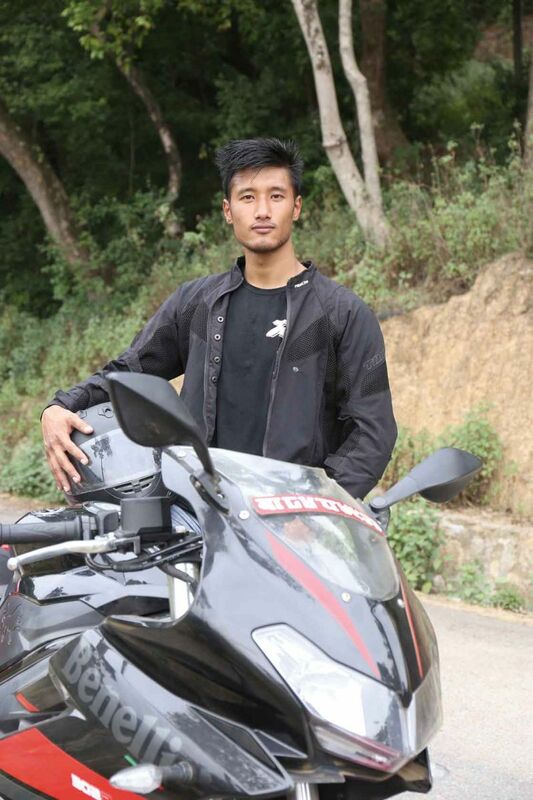 In the last few years, Bibesh Shrestha has kept rising and has stamped his name in motorcycle racing here in Nepal. He has already participated in more than ten different motorcycle races in the country, winning eight titles and has represented Nepal in the Asian Cup of Road Race 2015 held at Penbay International Circuit, Taiwan. Since the age of 11, Bibesh has been in love with motorcycles, but unlike many riders, he wanted more. He wanted to seriously pursue a career in motorsports rather than just riding it on a daily basis like any other commuter does. It wasn’t to become a career until March of 2014 when Bibesh got a taste of his first podium finish in Racemandu II. Since then, he has taken part in whatever racing events that took place in the country. He has always had the knack of not only participating but finishing on the podium. He won the 1st Off-Road TT Championship organized by Bikers Nepal in 2016 while his latest accomplishments include winning 2nd Runner-Up in Flat Track Racing and above all, bagging the title of National Category winner in Racemandu 2017. “Yes, motorsports in definitely bringing new prospects and opening doors for riders in Nepal,” says Shrestha. He believes that not only riders but also the sports sector of Nepal along with the automobile sector that benefit and influence motorsports in other countries. “We Nepali Riders couldn’t even imagine racing in a real circuit representing the nation four or five years ago. But now in a short period of time many riders of Nepal, including me have already participated up to Asian level championships representing Nepal even though we still do not have a permanent race track back home,” he adds. Like any other racers or riders who wanted to do something in motorsports here in Nepal, Bibesh also had to face many negative or discouraging comments. “When I first told my parents and friends that I wanted to do something in this field, they were not supportive and said this field will cost me more money than I could make from it which I think is true even today,” says Bibesh. But he was stubborn and wanted to prove that he could achieve something which he incidentally has done over the years. From then on, he said that he has been able to change the mindset of many people including his parents, and many riders have come up to him to tell him that what he achieved has motivated them to follow in his footsteps. While talking about the memorable moments of his racing career, Bibesh stays humble and thinks that every moment of his racing career till now is equally memorable for him. But after careful thinking, he chooses Asian Cup of Road Race 2015 at Pen Bay International Circuit in Taiwan as the most memorable one although he didn’t finish on the podium. “Experiencing something new is always memorable and for a rider like me from Nepal, getting a chance to represent one’s country in an international circuit was a proud and joyous moment. I also learned a lot from the international exposure and my racing skills have also developed tremendously since that race. “l think there is still a long way to go in terms of developing this sport here in Nepal. If there had been a proper race track, many good riders would have gotten a place to train, improve their racing skills, find sponsors and represent the country in the international arena,” laments Bibesh. But again with a smile back in his face, he stays positive and concludes that in the next five years, there will be a race track in Nepal, and the government body that is looking after motorsports, the motorcycle companies and Fédération Internationale de Motocyclisme (FIM) can collaborate and develop motorsports in Nepal.